Our heavy-duty-certified full service radiator shop is staffed by technicians with decades of experience and heat exchange repair and service. At Maas Radiator we understand you need your truck or equipment to make a living. We strive to get you back on the job as quickly as possible by offering heavy duty radiator cleaning, repair and recoring services. In fact, we are known as the area’s most reliable shop to service your heavy duty truck or equipment radiators. We clean and repair radiators for on and off road trucks, agricultural equipment, transit and school buses, motorhomes and heavy construction equipment. Not only that, but we work very hard to ensure you have minimal down-time. Our technicians are highly qualified to repair radiators made of all types of materials. From older units built from copper and brass to more modern radiators made of plastic and aluminum, our technicians have been trained on the latest and most effective methods used to repair your radiator. If your radiator happens to be beyond repair, we stock hundreds of heavy duty radiators to get you back up and running quickly. Our many years of experience have taught us that the charge air cooler is usually one of most neglected items on your truck or equipment. It is nearly impossible to know when a charge air cooler is leaking because there is no fluid that will leak out. Therefore, it is wise to have your CAC cleaned and tested any time you are doing service to your cooling system. This will help ensure your engine is performing at its peak level. In case of turbo failure, we can flush and clean the CAC to remove all the oil and debris that could cause future engine problems. Every job is completed by testing the charge air cooler to confirm it is not leaking before it goes back in your equipment. Our highly trained technicians are capable of repairing some types of leaks on charge air coolers. We have experience in all repair techniques including simple epoxy repairs to welding cracks in tanks. If your CAC is not able to be repaired, we can even recore by removing your tanks and welding them on a brand new core for a fraction of the price of the new charge air cooler for your ag or construction equipment. If your charge air cooler cannot be cleaned or repaired, we keep hundreds of replacement parts in stock and offer our standard line of backed by an unlimited mileage two-year warranty or a severe-duty bar-and-plate charge air cooler backed by a lifetime warranty. 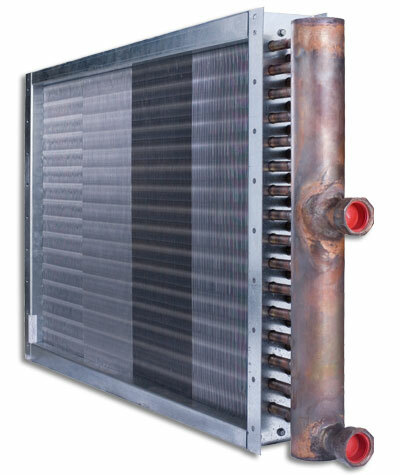 At Maas Radiator we have been servicing all types of heat exchangers for many years. We have extensive experience cleaning and testing tube and shell exchangers. In fact, we have the necessary equipment to physically clean each tube individually. Additionally, if the exchanger has a leaking or damaged tube our technicians have the knowledge to block that tube or even replace it. We have a custom-designed and built press to remove the tube bundle from the shell to allow us to clean it for efficiently and thoroughly. We can even build a new tube and shell heat exchanger manufactured from cooper-nickel materials making it stronger and less likely to deteriorate from contaminates in the fluids traveling through the system. 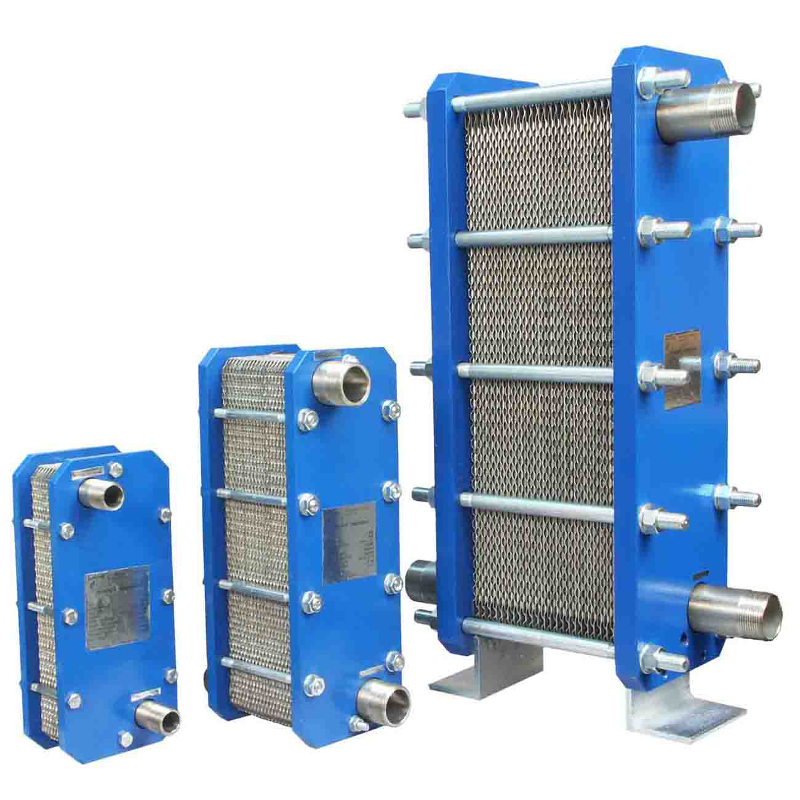 Since our early days, we have been servicing other types of heat exchangers as well. We have considerable experience cleaning and repairing tube and fin heat exchangers of all types. 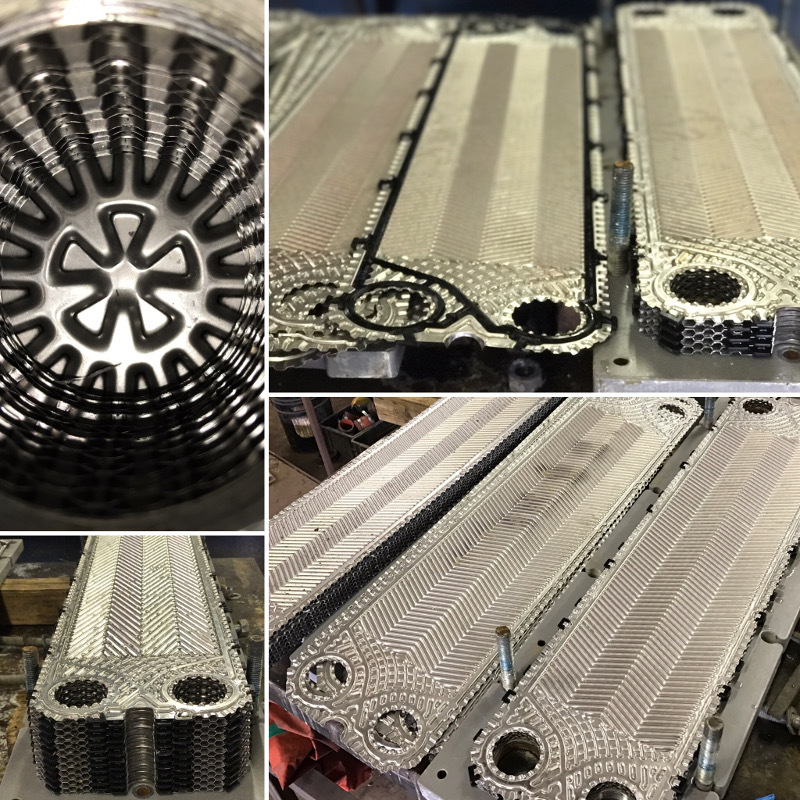 We are also capable to cleaning plate and gasket exchangers even when they require the intricate work of disassembly. Industrial oil coolers are found on many types of equipment from tractors to large air compressors and welders. They are used as hydraulic oil coolers or engine oil coolers among other uses. Replacement costs of these all aluminum units can easily reach many thousands of dollars. For that reason, we have worked hard to develop cleaning and repair methods that save you time and money. 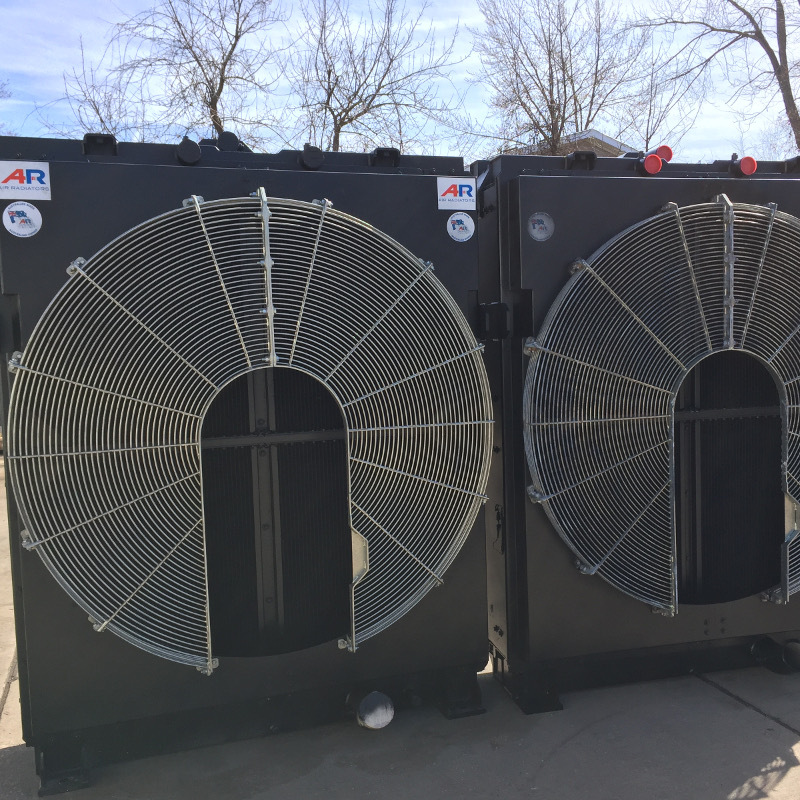 Many times these coolers are used in very dirty environments and require periodic cleaning. Often that does not happen frequently enough and that is when we can help by cleaning the oil cooler externally and internally to ensure it performs at its optimum levels. Every time we service a cooler of this type it is pressure tested and if it happens to be leaking, we are able to repair many types of leaks without the need to replace the cooler. In fact, we can even cut into the tank to block off an entire tube or tubes that may be leaking. 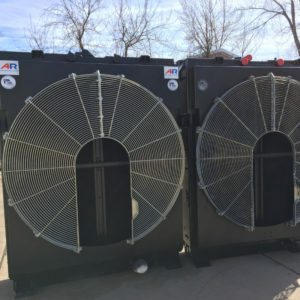 Most of these coolers are constructed with a bar and plate style core and we can remove the tanks from your old cooler and weld them on a brand new core matching the specs of the original unit. This can usually save you considerable money over a brand new oil cooler and it performs just as a new unit. Many types of HVAC equipment are simply heat exchangers and our technicians are usually capable of repairing them. From steam coil tubes and fittings to air conditioning parts, we have probably repaired them before. In fact, we have even had success repairing some types pool heaters and other household heat exchangers. Many buildings like schools are heated with steam and every room must have a steam coil to produce heat. We are able to build replacement steam coils nearly identical to your original or even build one to your alternative specifications. Classic and muscle car radiators are built from copper and brass and we have been repairing these types of radiators since 1934. One advantage to this older style radiators is that there are many more repair options as compared to modern radiators. We can even recore these radiators with custom built cores built to the exact specifications of the original unit. If your radiator is not able to be repaired or recored we are an authorized distributor for US Radiator – a leader in new replacement radiators for classic cars. Many radiator shop’s want to sell a replacement radiator any time someone with an automotive radiator calls their shop. At Maas Radiator, we will clean and repair all types of radiators. We can repair tube leaks, minor fin damage and even replace the plastic tanks and gaskets. If your automotive radiator has extensive damage, our skilled technicians and service advisors know it will be more economical to replace the part. We will provide a price for a new radiator with a price that beats local parts stores every time. Many types of A/C Condensers can be repaired, potentially saving you hundreds of dollars in replacement costs. We are capable or repairing or replacing the fittings for the hoses on many types of condensers. Before you decide your condenser must be replaced, let our trained technicians assess the problem. Older cars and trucks including heavy duty trucks were equipped with copper and brass heater cores that were constructed similar to older radiators. If these units are leaking they can usually be repaired or even recored. This is ideal when the parts are no longer available which happens quite often on classic applications. Custom Aluminum Radiators – We can custom build virtually any radiator out of aluminum. 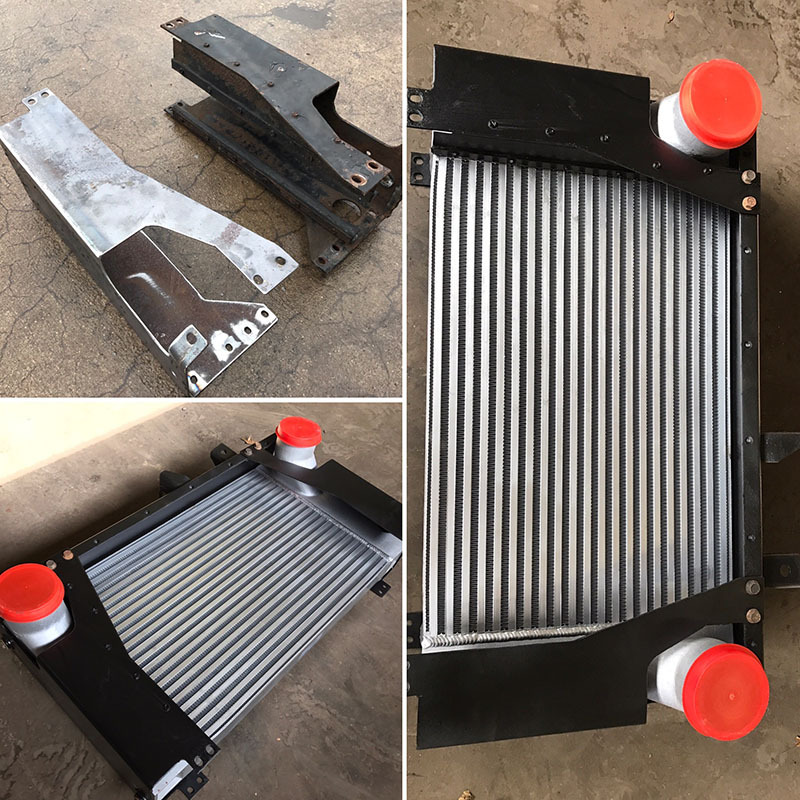 If you only have dimensions and specifications for the radiator you need or you are trying to recreate a classic car or muscle car radiator out of aluminum we can help. 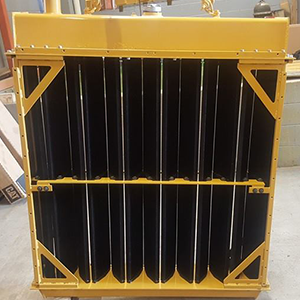 Custom Fabricated Brackets – From time to time we are faced with a situation where a radiator or charge air cooler uses steel bracketry that is no longer available or is cost prohibitive to replace (in the case of heavy equipment or transit buses). Our metal fab shop can custom fabricate new brackets that are nearly identical to your original. 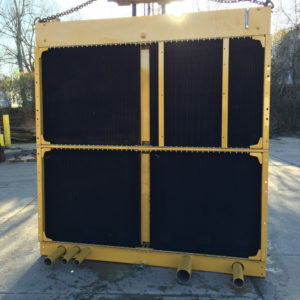 Custom Fabricated Radiator Tanks – When your radiator has steel tanks that are rusted out and beyond repair its no problem for us. We will fabricate custom tanks when necessary and we can even install transmission coolers in the new tanks. We understand you need your truck or equipment to make a living so we work hard to get you back on the job as quickly as possible! If your equipment is overheating or you have had a failure in another system, we can clean your heat exchange equipment to make it function like new. We use heat, steam and chemicals to clean even the dirtiest radiators, charge air coolers and oil coolers. Certain radiators can even be take apart to have the tubes physically cleaned by pushing out the debris. Has your radiator, charge air cooler or oil cooler started leaking or did you damage it while servicing your car, truck or equipment? Our full service radiator shop can fix nearly any leak. Our extensively trained technicians use the latest repair techniques to fix your heat exchanger right the first time. Every repair is properly completed by cleaning and testing to ensure the job has been completed with perfection. 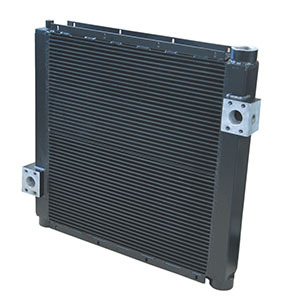 If your radiator, charge air cooler or oil cooler is not able to be repaired, Maas Radiator can recore them more economically than new parts. We source new cores from only the best manufacturers in the industry so your final product is as good or sometimes better than the original! If we are unable to clean, repair or recore you equipment, we have extensive line of components in stock. 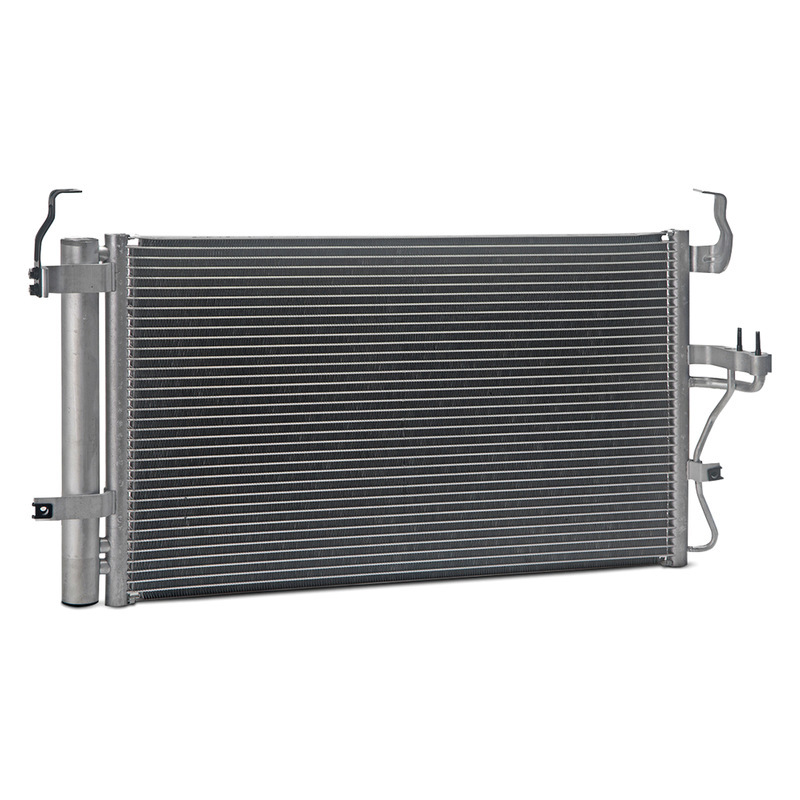 We have a complete selection of replacement radiators, charge air coolers, A/C condensers, turbos and more.